With the flip from Tuli Letuligasenoa on Monday, UW moved ahead of USC as the Pac-12’s No. 1 class in the 247Sports composite rankings. A year ago, the Huskies lost their most high-profile recruit about a week before National Signing Day when five-star defensive tackle Marlon Tuipulotu switched his long-standing commitment from Washington to USC. It was, at the time, a rather devastating blow for the Huskies. On Monday night, the Huskies returned the favor, getting four-star defensive tackle Tuli Letuligasenoa to drop his long-standing commitment to USC and pledge to UW. It’s the latest jab in a growing head-to-head recruiting rivalry between the two traditional West Coast powers, and it’s the result of Chris Petersen’s philosophical shift to target the type of mega recruits coveted by blue-blood programs. “Chris Petersen has really expanded the footprint of the caliber of player that Washington is going to recruit,” said Brandon Huffman, national recruiting editor for 247Sports.com. “No longer is he afraid — he never really was afraid to go after the top-end guy. But as he built this program, he really focused on the Northwest kids. He would go after select players in California, but now it’s on. On Wednesday, the traditional National Signing Day will arrive without the typical fanfare of past years. That’s because roughly 70 percent of major-college recruits already signed during the new early signing period in December, according to ESPN. For Washington, though, there remains much intrigue going into Wednesday. For one, the Huskies are trying to hold off the Trojans to finish with the Pac-12’s top-ranked recruiting class for the first time in the modern era. With Letuligasenoa’s flip, UW moved ahead of USC as the Pac-12’s No. 1 class in the 247Sports composite rankings, and to No. 9 in the national rankings. USC has had the Pac-12’s No. 1 recruiting class in each of the past four years and in 13 of the past 15 years. In addition to Letuligasenoa, the Huskies were able to land five-star linebacker Ale Kaho (who in December became the first five-star Petersen has ever signed) and four-star defensive back Julius Irvin (who intends to sign with UW on Wednesday) — two recruits that USC and Alabama had both wanted. In the case of Irvin, Huffman said the Huskies did especially well considering Nick Saban had personally tried to recruit the defensive back to Alabama. “He’s a kid in years past (the Huskies) probably don’t get,” Huffman said. 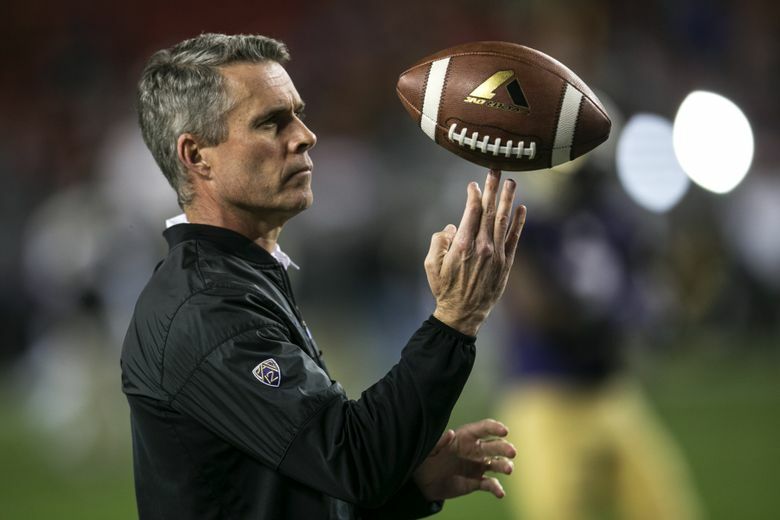 As he established himself and his culture at UW in 2014 and 2015, Petersen appeared more selective about the recruits he sought. He landed some big names, to be sure — Budda Baker, Jake Browning, Trey Adams, to name a few, had opportunities to play just about anywhere — and the success those guys have had the past two seasons has helped vault the Huskies into a top-10-type program. That opens more doors on the recruiting front, and UW coaches have taken advantage in this 2018 class. Huffman predicts the UW-USC recruiting battles will heat up for some top 2019 recruits, too. “I think we’re going to start to see them go head to head (even more),” he said. “But unlike when Steve Sarkisian was the Washington coach, and trying to go up against Pete Carroll for a year or Lane Kiffin, Chris Petersen is actually targeting guys UW had a realistic chance of getting. The Huskies, it appears, have a realistic chance of landing one more recruit on Wednesday. Four-star defensive end Jeremiah Martin, who made official visit to UW this past weekend — he was in the crowd for the UW men’s basketball team’s thrilling upset of Arizona — has the Huskies among his final four programs. Martin is scheduled to announce his decision at 10 a.m. Wednesday, and a commitment from him could solidifying the Huskies’ class as the best in the Pac-12. NOTE: Petersen does not plan to hold his usual National Signing Day news conference on Wednesday, a UW spokesman said. Petersen did speak on Dec. 20 about the recruits who signed during the early signing period.